Aluminum foil is recyclable if it’s free of food residue. Do not recycle dirty aluminum because food contaminates recycling. Try rinsing the foil to clean it; otherwise, you can throw it in the trash. Items such as potato chip bags are made of a metallized plastic film, not aluminum, so don’t recycle them. Find out what you can do with potato chip bags. Scrunch an item you’re not sure about in your hand and, if it springs back, it’s not aluminum. Protect your young plants from insects by wrapping its stem loosely in aluminum foil. Crumple up a used piece of aluminum foil and use the ball to scrape the crust off your grill. 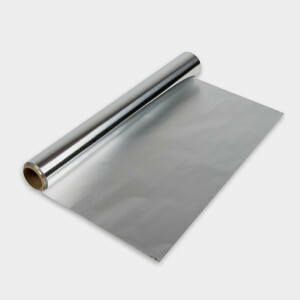 Tin foil was the first commercially available foil and was in use from the late 1800s through the early 1900s. What we call “tin foil” today isn’t the same although it still persists. Luckily aluminum foil does not add a metallic aftertaste like true tin foil.